After our exciting adventures in Queenstown, we felt like doing something a little more tranquil for the next few days, and so we made our way to Doubtful Sound in Fiordland. It’s virtually impossible to travel there independently, so we joined a tour group. We were a little startled when we realised we would be joining a group of around 50 sexagenarians as the tour began, but why shouldn’t we all get along? More interesting however, was the style of commentary used by the tour guides for the remainder of the trip: it was very much in the realm of the superlative. 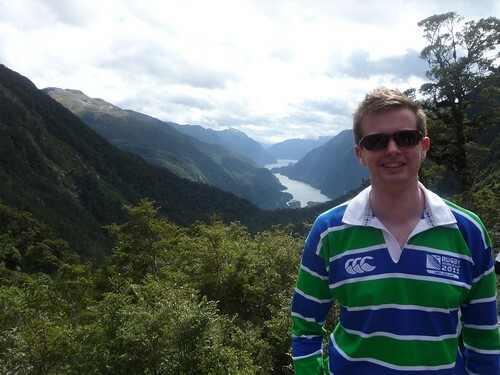 Our entire trip would be within Fiordland, New Zealand’s largest national park; it’s also one of the least explored areas of the country. 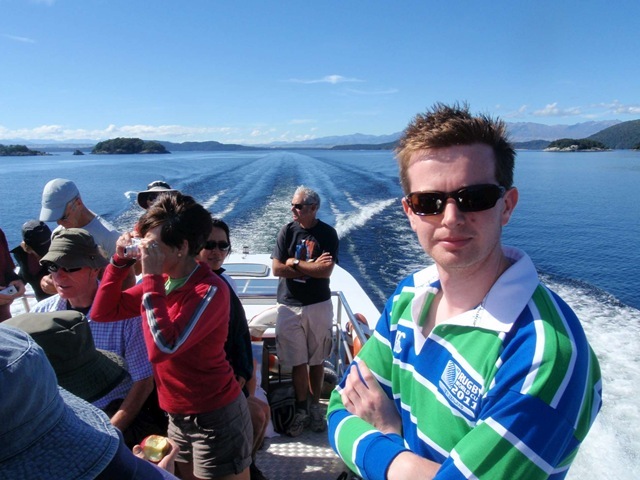 We started our journey by taking a ferry across Lake Manapouri, which is the fifth-largest and second-deepest lake in New Zealand. The skipper was keen to point out Pomona Island (the lake’s largest island) on the way for some particular reason, but we had reached our superlative quota for the minute, so it passed us by. Instead we enjoyed the view from deck. On the other side of the lake was the Manapouri Hydro-Electric Power Station, New Zealand’s most controversial infrastructure project of the twentieth century. 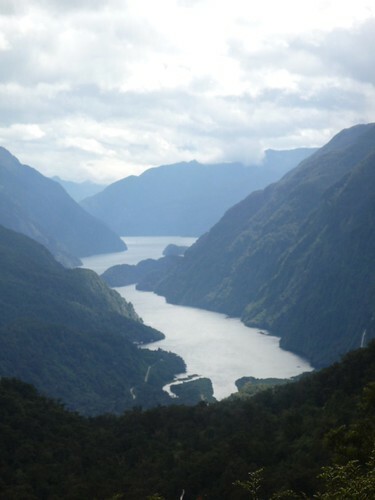 Original plans had intended for the water levels in Lake Manapouri to be raised by 30 metres, but massive nationwide protests prevented this from happening. The power station is at the beginning of New Zealand’s most expensive road, which leads to Doubtful Sound. (It is not part of the road network and was built only as a supply route for the construction of the power station in the 1960s). 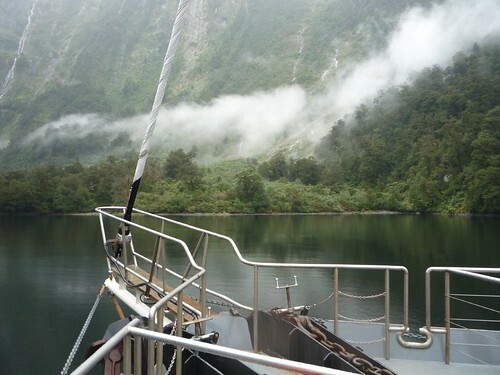 We boarded a coach to be taken over a mountain pass and down to our boat in Doubtful Sound via the “million-dollar view”. 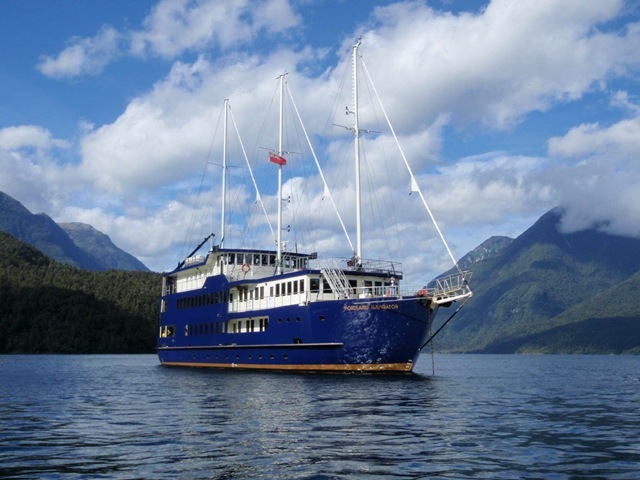 Once we arrived at Doubtful Sound (New Zealand’s second-largest fjord; the largest, Dusky Sound, is accessible only from the ocean by boat), we were able to check out our new home, the Fiordland Explorer. After a week living in a campervan, the promises of a soft bed and having meals cooked for us were very reassuring. The boat was quite a heavy beast, but had masts and some sails which we thought were probably just added for decorative reasons. As soon as we set off, we were assured about what an amazing trip we were going to have. 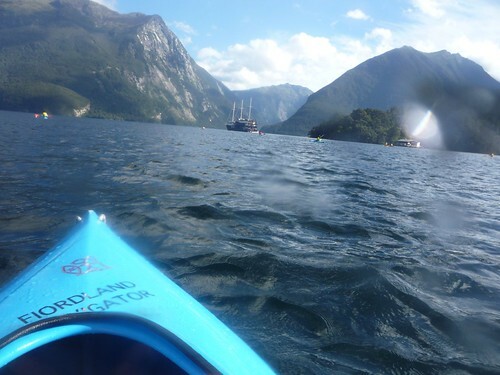 Most tourists visit Milford Sound to the north, but Doubtful is “three-times longer” than Milford, and has “ten-times the surface area”. “Oh good,” muttered the crowd. Furthermore, we were told we were the luckiest tour group for some time, as we had such amazing weather; it normally rains 300 days per year. It was a phrase we were going to hear many times over the remainder of the trip. The boat had a number of kayacks available, and I made use of one primarily to escape the running commentary. After an (intentional) swim in the 11C water (which was fairly bracing but great fun), we cruised towards the mouth of the fjord. It is named “Doubtful” as Captain Cook was doubtful of whether he would be able to sail out if he entered. We passed Secretary Island, which is New Zealand’s fifth-largest island. At this point, Hadyn and I were beginning to wonder if it was really necessary to mention a fifth-place ranking, particularly one specific to quite a small country. 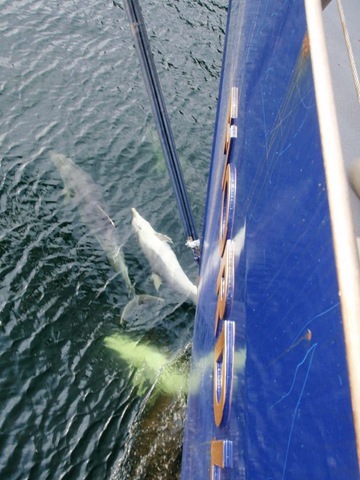 As we endured more statistics being reeled off, we were delighted to be joined by the southernmost population of bottlenose dolphins. For what must have been the better part of an hour, around ten dolphins were jumping in front of the ship or in its wake. I really got the sense that they were enjoying themselves and that we were one of the highlights of their day. 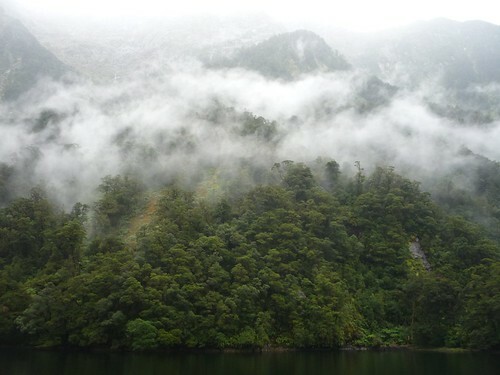 The next morning produced far more typical Doubtful Sound weather: rain, and lots of it. Not one to be affected by the conditions, I donned my rain jacket and grabbed a mug of tea before proceeding to the deck to be informed again about the mosses, lichen and liverworts. Nonetheless, the fjord took on an aura of mysticism with the low clouds rolling by and the sound of rain pattering away. It was time to retreat from this fairytale kingdom and head back to the campervan. We saw some marvellous scenery, and although listening to the consistent onboard commentary was fairly laborious, we ate very well and were looked after by staff who must have to do the same thing over and over for each group on the boat.